Each neighborhood has a history that shaped its own unique identity, and together they make up the fabric of Columbus. And at the core of our city is a neighborhood in the midst developing a new identity. On this week’s episode of Columbus Neighborhoods, we explored the changing landscape of Downtown Columbus. What better time to get out and explore the neighborhood yourself? 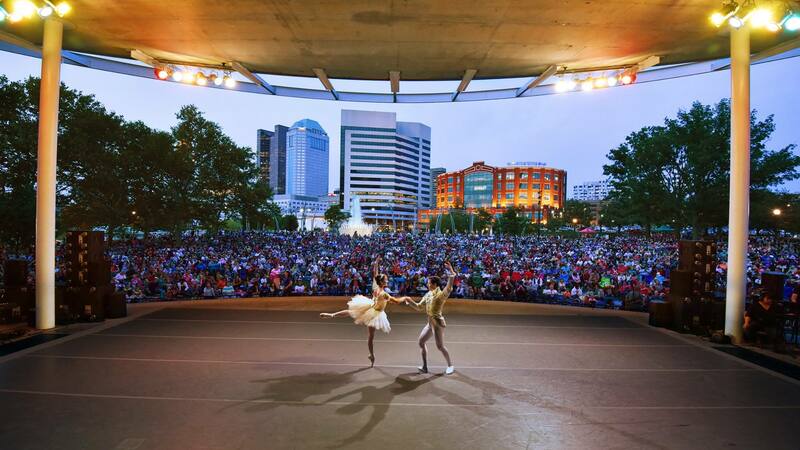 We’ve rounded up 21 free and fun activities for you to get the Downtown Columbus experience this summer. See the lights at Red, White & Boom! We admit it — we’re guilty of vacating Downtown ASAP every July 3, before the traffic swells to East Coast levels of madness. But when was the last time you stuck around for the Red, White & Boom! festivities? It’s the one time of year you can catch a firework show over the skyline. And now with plenty of alternative transportation options — the free CBUS circulator, Car2Go, CoGo bike share, Uber and Lyft — you can leave your car at home. The festival kicks off at noon on Monday, July 3, with inflatables for the kids, a beer garden for the grown-ups and live music for everyone. The parade steps off at 6 p.m., and the first firework will be lit around 10 p.m. It can be hard to keep up with the latest and greatest in regional food and music. Luckily, the best jazz artists and barbecue pit masters come to us each year for the Jazz & Rib Fest. This year, they’re taking over Bicentennial, West Bank and Genoa parks July 21 to 23. It’ll be hard to miss — the sounds and smells will draw you in. And what better way to enjoy some Southern-inspired cuisine than with three stages of impressive improvisation? 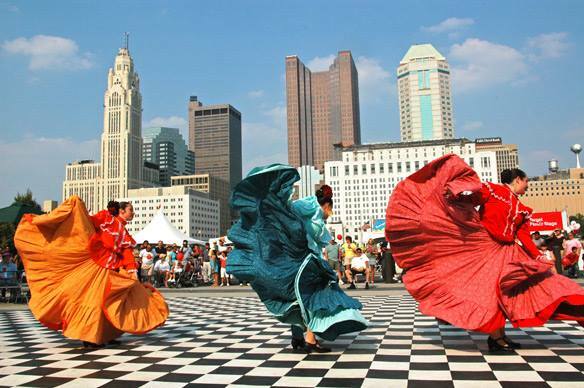 An explosion of color, lively music and dance and flavorful food is coming to Genoa Park from Aug. 12 to 13. This year’s Festival Latino headliners include salsa pros Charlie Cruz and Tito Nieves, fusion group Bachata Heightz and Tono Rosario (formerly of Los Hermanos Rosario). If you have little ones, be sure to check out the children’s area, featuring activities like crafts and face painting. Typically held earlier in festival season, Park Street Festival was rescheduled for Aug. 25 to 26 this year. But don’t let that keep you from making your way to the festival’s namesake street to celebrate the 10th annual event. The entertainment lineup hasn’t been announced yet, but we do know there will be food trucks, craft vendors, family activities and, of course, plenty of drinks (event sponsors include Bar Louie, Brothers and Park Street Tavern). Operated by the Ohio Arts Council, the Riffe Gallery is open every day except Sunday, always with free admission. On view now is After Hours, an exhibition showcasing the hidden talents of State of Ohio employees. Hurry over — the show closes July 8. Then visit again on or after July 27, when Ohio: The Start of it All opens. This exhibition will feature 60 Ohio-related children’s book illustrations from the University of Findlay’s Mazza Museum collection. When was the last time you visited the Ohio Statehouse? If the answer is on a school field trip, it’s time to rediscover the wonder of this historic and architectural gem. Get the full experience on a free tour with knowledgeable guides who share fun tidbits. Bonus: Through the end of September, the Statehouse is also offering tours of the grounds, highlighting the architecture, monuments, foliage and even a beehive! While there’s no shortage of author talks in Columbus, few are free. But the Columbus Metropolitan Library has recently launched a new series of free author presentations at the main library downtown, making these educational events more accessible to the public. Next up is William Shkurti (Soldiering on in a Dying War, The Ohio State University in the Sixties: The Unraveling of the Old Order) on Thursday, July 20, followed by Kimberla Lawson Roby (A Sinful Calling, Copycat) on Sunday, Aug. 27. Did you know admission to the Columbus Museum of Art is free on Sundays? If you haven’t been in a while, it may be time to revisit this quintessential Columbus institution. The museum’s most recent exhibition, Red Horizon: Contemporary Art and Photography in the USSR and Russia, 1960-2010, features Soviet and Russian art, including photography by Neil K. Rector. The show also coincides with the centennial of the 1917 Russian Revolution. 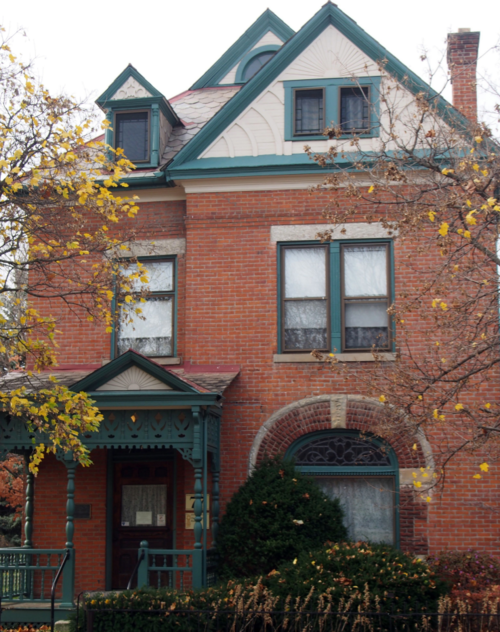 When author and cartoonist James Thurber was a student at Ohio State University, he lived on Jefferson Avenue with his family. Now listed on the National Register of Historic Places, Thurber’s former home has been repurposed into a museum in his memory. Self-guided tours of Thurber House are free (or you can spring for a guided tour for $2 to $4). You’ll get a window into Thurber’s world through manuscripts, family photos, letters and more. And be sure to keep an eye out for regular author talks, writing workshops and more at Thurber House. When exploring the Scioto Audubon Metro Park, it’s easy to forget you’re in the middle of a city. This 120-acre nature oasis is the perfect place for your favorite outdoor activities, from running and biking to fishing and kayaking. Scioto Audubon has also become a destination for rock climbers. 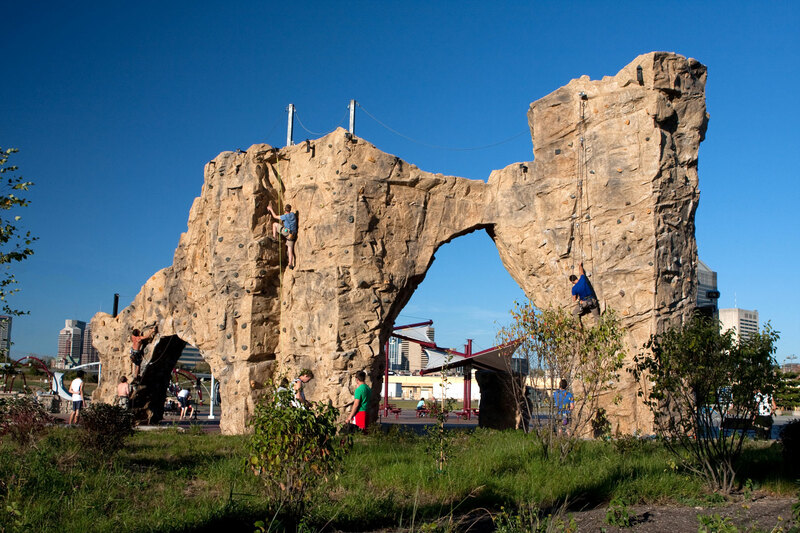 Reaching 35 feet high, the climbing wall is free to use (but you have to bring your own equipment). Metro Parks is even hosting a free Community Rock Climbing Festival here Aug. 26 to 27. Along with competitions, the festival will also include climbing clinics for beginners. On sweltering summer days, there’s nothing quite like jumping in a pool. But if you don’t have access to swimming spot, running through the Scioto Mile Fountain might just be the next best thing. Kids and adults flock to the 15,000-square-foot fountain in Bicentennial Park. Don’t want to get wet? Take in the riverfront view from the sidelines — a prime people-watching spot. Among the many programs and events at Columbus Commons is a two-part summer series of free outdoor fitness classes. Ohio Fit Club instructors lead cardio, yoga, Zumba, kickboxing, boot camp and hip hop classes. The first part of this summer’s series ended June 10, but have no fear — the second session kicks off Tuesday, Aug. 1 and goes through September. After you complete the online waiver once for the season, you can just show up to the classes of your choice — no signup necessary. It may be a bit counterproductive, but we recommend rewarding yourself with some Jeni’s ice cream afterward. Free samples, anyone? Concert season can quickly get expensive. But with plenty of free shows through the summer, it doesn’t have to be. 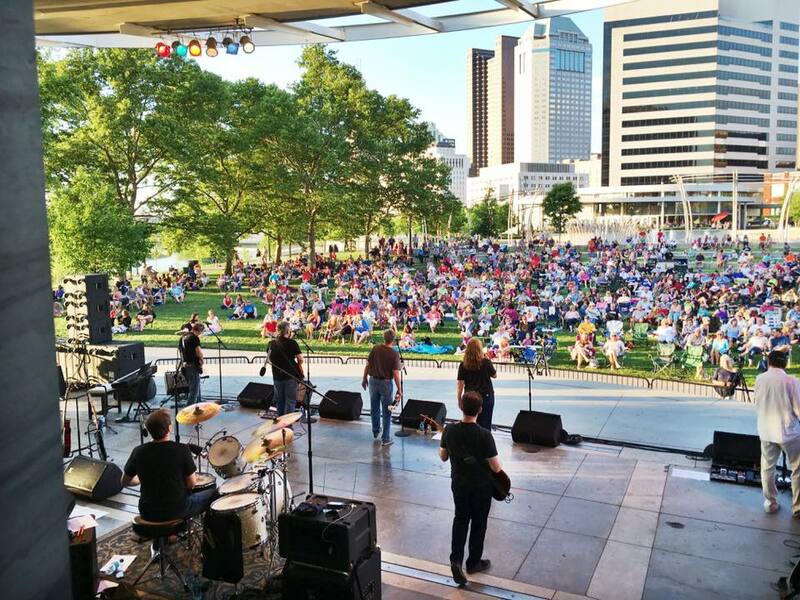 It’s already halfway through the Rhythm on the River season, but there are still two free Friday-night concerts in Bicentennial Park to go. Bluegrass fans won’t want to miss The Seldom Scene and Michael Cleveland & Flamekeeper on July 14. The last performance features a preview of BalletMet’s upcoming 40th anniversary season, and we have no doubt they’ll pull out all the stops. Now in its ninth season, the PBJ & Jazz series is geared toward kids and families. Each hour-long concert in Topiary Park is followed by a hands-on art activity, and concertgoers often bring picnics to enjoy during the show. Upcoming performers include the Bright Moments Quintet on July 8, the Liz Woolley Band on Aug. 12 and ZC7: Latin Jazz Experience on Sept. 9. Spend your Sunday afternoons at Goodale Park in July and August. The park’s music series presents six concerts each summer, accompanied by activities for kids and local food trucks and vendors. This year’s lineup features Hebdo, The Deeptones, Yellow Paper Planes, Bummers, Counterfeit Madison with Mary Lynn, and Noe Salsa Project. While many concerts at the Commons are ticketed events, the park also offers several free performances that span a range of genres. There’s the Downtown Live Concert Series, which showcases three different local acts every Thursday in July. Catch Columbus favorites like Mojoflo (July 6), The Floorwalkers (July 27) and more. The bar and food trucks open at 5 p.m. — happy hour, anyone? — and music starts at 5:30 p.m.
Plus, the Commons is also hosting performances by The Navigators (July 14), McGuffey Lane (Sept. 1) and Shadowbox Live’s Bigger than Jesus: The Beatles, the Band that Changed the World (Sept. 3). It only makes sense that North Market would host a seasonal farmers market, expanding their already impressive lineup of local vendors. 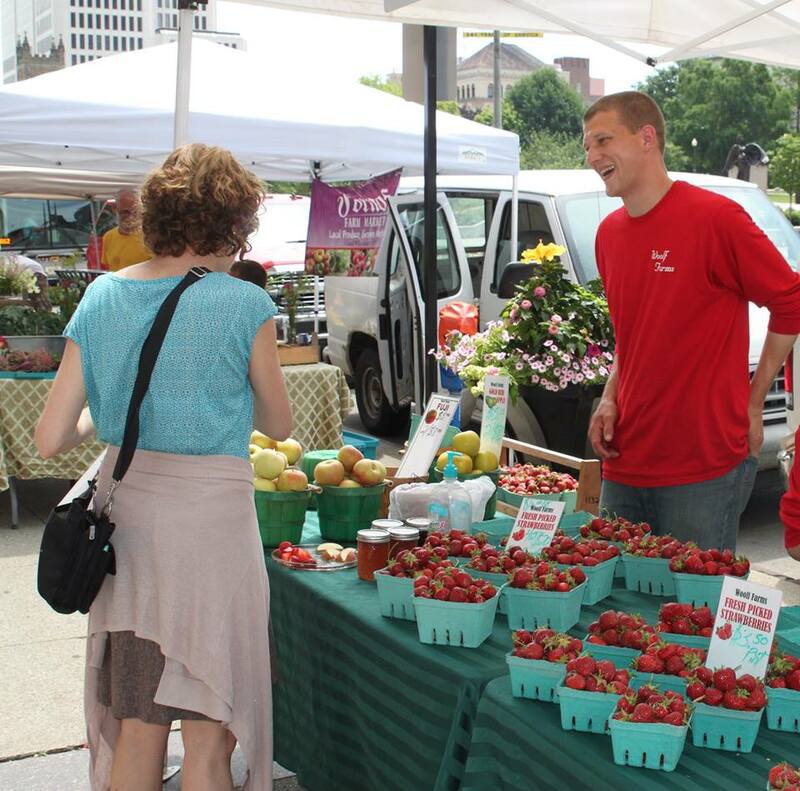 Every Saturday through the summer, you’ll find more than 20 farmers set up outside starting at 8 a.m. New to the market this year is Jorgensen Farms. Then on Sundays, come back for Peddler’s Picnics, featuring local artisans and crafters. It’s the perfect place to find gift ideas while supporting local businesses. Vendors are on site from 10 a.m. to 3 p.m. Sometimes Saturdays need to be reserved for sleeping in, and we don’t always make an early-morning farmers market. That’s where Pearl Market comes in. Through mid-October, local vendors selling produce, prepared foods, handmade wares and more line Pearl and Line alleys Tuesday through Friday, from 10:30 a.m. to 1:30 p.m. It’s a favorite lunch spot for people who work downtown. Since 2013, the Moonlight Market has been a popular summertime destination. On the second Saturday of each month from April through October, pop-up shops, food trucks, street musicians and more gather for an evening event starting at 6 p.m.
Last year was the first season of the Sunlight Market, the daytime iteration of the market. Targeting the brunch crowd, the Sunday market runs from 11 a.m. to 4 p.m. once a month April through October. Upcoming dates are July 16, Aug. 20, Sept. 17 and Oct. 22. 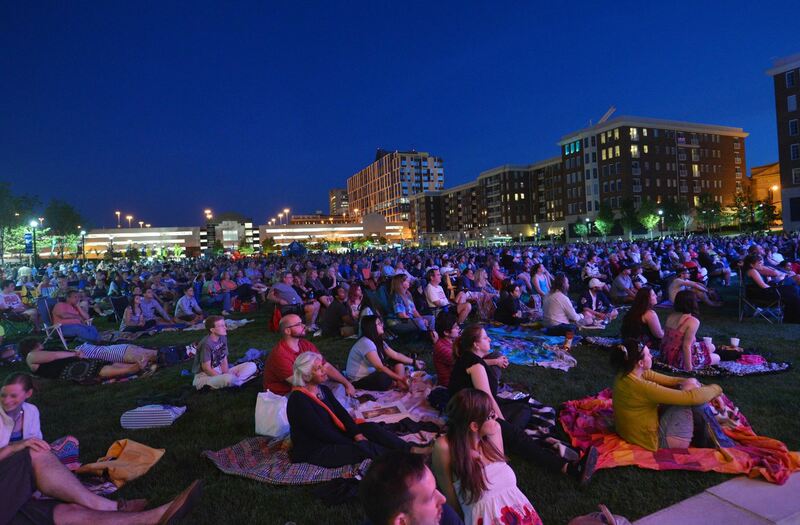 Drive-in movies are a summertime staple, and that’s the inspiration for Columbus Common’s movie nights. No car required. Prepare a picnic, or just bring a blanket or lawn chair and buy food there. Catch The LEGO Batman Movie on Friday, July 21, and The Jungle Book (2016) on Friday, Sept. 2. Did you read the book before seeing the movie? You’re sure to get this question at Topiary Park’s From Book to Film movie series. Either way, it’s a good reason to revisit the classics. And did we mention free popcorn? The park is screening Curious George on Saturday, July 15 and The Devil Wears Prada on Saturday, Aug. 19. Movies start at dusk. We explore the changes the Downtown riverfront has seen over the last century. Amy Taylor of Columbus Downtown Development Corp. fills us in. This entry was posted	on Friday, June 30th, 2017 at 5:23 pm	and is filed under Blog, Story. You can follow any responses to this entry through the RSS 2.0 feed. Both comments and pings are currently closed.